This Slant Front Desk is made of of solid premium South American Mahogany with striking figured mahogany drawer fronts and desk lid. The interior drawer parts are made from solid quarter sawn poplar. 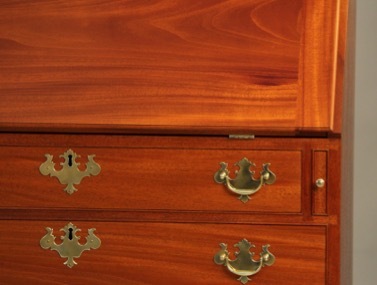 The desk sides and top are made from a solid 21” wide piece of mahogany. Hand-cut dovetail joinery is used throughout this desk including exposed dovetails on the desk top and the fully dovetailed drawers. 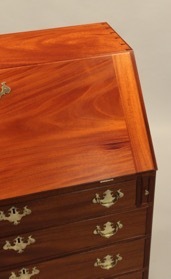 This desk has beaded dividers that have hand cut and fit dovetail joinery and mitered beading. The desk interior is custom designed for our client and will have features and influences from fine antique desks from the 18th century. The interior is designed around modern needs and uses. We make desks with custom interiors to fit individual clients needs. We make Slant Front Desks and other fine custom and reproduction furniture to order combining meticulous attention to overall quality with the finest hardwoods available today.